ACE Archaeology Club was formed in 1997, as a direct result of the production of the Chulmleigh and Winkleigh Community Books, the year before. Those of us, who were involved in researching the History and Archaeology for the books, soon discovered that not a lot of work had been done in this part of Devon. So our club was formed and, with a grant from the Winkleigh Community Book committee, for equipment, we were able to get to work straight away. Our aim is not only to find out and record the archaeology in this part of Devon, but also to encourage others to get to know the fantastic heritage that exists hereabouts. ACE meets every first Saturday of the month, where will depend upon the activity, as we have no headquarters as such. There is a quarterly newsletter for members with reports, updates and a diary of meetings and events. As well as our regular meetings, there are on going projects that our members are involved with, both participating in and running. In 2003 ACE adopted Dr Sandy Gerrard’s Dartmoor Archaeology and Bracken Project, studying the effect Bracken rhizomes on archaeology. More recently, The Moistown Archaeology Project commenced, this was the result of research undertaken by ACE Archaeology Club into the medieval and post-medieval settlement at Moistown, part of Pattiland Farm. ACE's involvement in Moistown started in 2008 with a one-day survey training session offered to the Broadwoodkelly History Society by ACE. Part of the sunken lane leading to Moistown was chosen for the training session, as the rest of the site was obscured by vegetation. The potential for more work at Moistown soon became apparent and with the continuous support of the landowners, much scrub clearing and field work has taken place. Moistown is now being excavated, each year ACE spends three weeks digging, gradually revealing the story of the site. 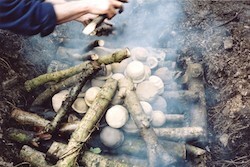 Alongside the serious archaeology we also delve into the experimental side, this really helps you appreciate how things were made and used, we have tried; making and firing Neolithic pots, flint knapping, ancient black smithing, iron smelting, textiles, food and drink and building a roundhouse or two. Moistown dig by Ace Archaeology. Opening up a new trench at Moistown. Future archaeologists, have a go at digging. 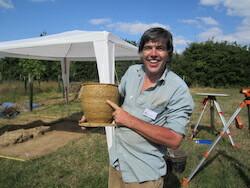 Festival 2013; an ACE neolithic pot made during the festival. 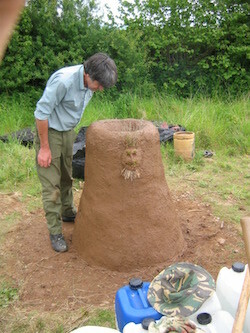 Experimental archaeology; putting the finishing touches to an iron smelting furnace. 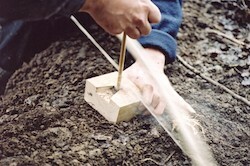 Experimental archaeology; lighting a fire without matches, using a bow drill. Experimental archaeology; firing neolithic style pottery in a clamp kiln. 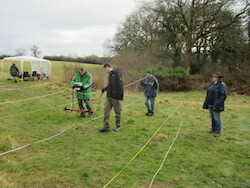 A geophysical survey (earth resistance) at Moistown. 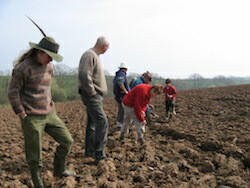 Fieldwalking; looking for flints in a field near Winkleigh.